So back to the Faversham exhibition, and Dr Diane Heath, Harriet Kersey and I arrived at 12 Market Place opposite Faversham Guildhall last Wednesday to be let in by the council’s caretaker where we awaited Peter Heath, Diane’s husband who had generously agreed to collect the exhibition boards and pop-up banners from the printers to ensure delivery and to save on the delivery charge. Although Faversham’s one-way system made matters somewhat challenging, Peter arrived safely with the artwork and while we made space for these items, he kindly unloaded his van that included a step ladder to allow us to hang the boards high enough on the wall to give sufficient room underneath for the timeline. 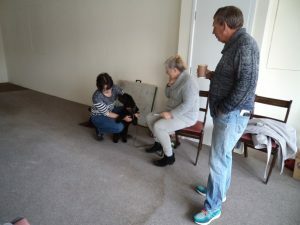 Harriet, Diane and Peter, and Poppy the dog. More about the latter in a minute, but it was agreed that firstly we needed to hang the A0 thematic boards. While we were working out the centre line of the long wall Cllr Nigel Kay arrived to see how things were progressing. We have been working with him since the beginning of the project and he was very excited to see this first stage come to fruition. 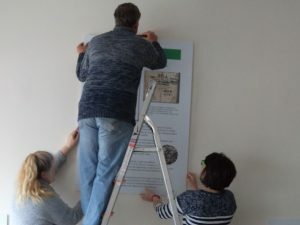 Because we were starting to make some progress, aided by Peter, Nigel went off to buy refreshments and we continued to set up the exhibition boards. I won’t describe these in detail because the virtual exhibition will be on the Centre’s website very soon (I’ll let you know when), but suffice to say among the boards there is one on Stephen, Matilda and the founding of Faversham Abbey; another on the wall paintings in the parish church that today are almost totally hidden; one on Faversham and the Cinque Ports, including reference to the 2000 herring and 100 ‘grayling’ that successive Wardens believed should be an annual ‘gift’ from the town, and, of course, one on the town’s copy of Magna Carta. Fixing the first exhibition board. All of this was surprising time consuming and Harriet had only seen one board mounted on the wall before she had to head off for the station and her return to Canterbury for a meeting – for her main job. However, we pushed on and got all the wall-mounted A0 boards up by lunch time, allowing Peter to depart back home to Ramsgate with the ladder and Poppy, Diane’s dog. By this time, too, Nigel was very keen to see the pop-up banners and rather than put up the timeline, we opened the banner boxes. These will be displayed around the exhibition room once it is cleared and the remaining building work completed, but, in the meantime, Nigel had the good idea of displaying the banners close to the front windows so that passers-by can stop and read the information and look at the various images. Nigel was right, people did stop and read, which meant that by the time we left we had spotted quite a few people who had done this. Among these banners are ones on the Maison Dieu and the moot horn, and hopefully this will persuade some to visit the Maison Dieu at nearby Ospringe because it is well worth a visit. The pop-up banners as seen from Market Place. During all of this activity, Dr Pat Reid of the Faversham Society Archaeological Research Group came by to see what would be available in terms of display cases. We had set up a small one near the back of the room, the other two large ones being out of bounds for the time being until things have been cleared from the room. Nevertheless, the small one will be adequate for our purposes for the time being. Consequently, Pat went away with an idea of how much can be displayed using Dr Brian Philp’s artefacts from his excavations on the Abbey site, and since this visit Pat has given up a list of the objects so that we will be able to create labels and a list of what is there. Diane with the A0 boards and a section of the timeline. Once Pat, Peter and Nigel had gone, it left Diane and me to mount the timeline on the wall below the A0 boards. 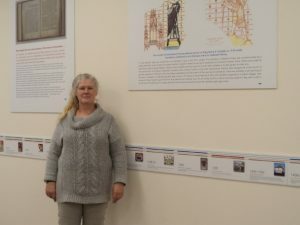 There are 40 small boards, each highlighting an event/occasion in the town’s history, as well as some covering national events to give a chronological skeleton for the local reference points. As you might expect some centuries are far better represented than others, but after the Anglo-Saxon period when documented events are pretty scarce, things do improve considerably. Due to the dating of many of the town charters, the 13th century is well represented, and for different reasons so is the 16th century. 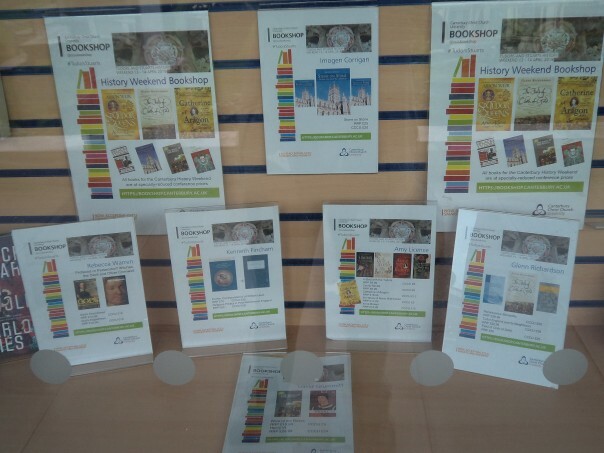 I need to discuss this with James Sladden at Queen Elizabeth’s Grammar School, but we think the timeline could be the basis for Year 7 history projects, with an alternative being a creative writing project using either information from the boards or pop-up banners. More on this after we have had our discussion, but potentially this could be very exciting with certificates for all who enter and a winner and runner-up prizes in each category. Consequently, once we had installed all of the timeline Diane and I stood back and admired our handwork. Animals & Us in Margate (photo Diane Heath). I’m not sure when it will open to the public because of the still unfinished building work, but at least people can enjoy a section of the exhibition. 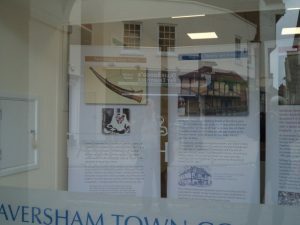 Furthermore, just having the pop-up banners has demonstrated local interest, hopefully a good omen for the ‘Faversham Museums Together’ group that is backing a bid for HLF project funding towards more permanent displays at the Heritage Hub. 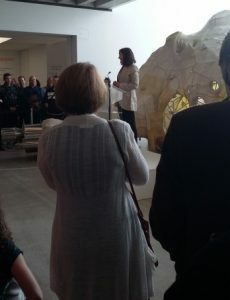 Helen opening the exhibition at Turner Contemporary (photo Diane Heath). Finally, I want to mention briefly an event that Diane attended at Turner Contemporary at Margate yesterday evening. 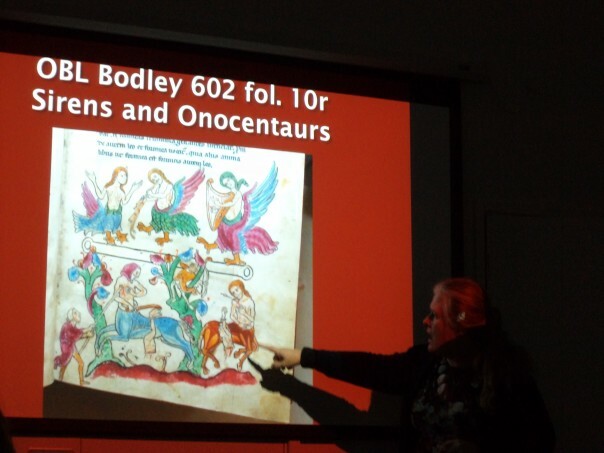 She has contributed to the new exhibition there on ‘Animals & Us’ by discussing the medieval bestiary at Canterbury Cathedral Archives and Library, and ideas about animals in that period more generally. The exhibition was opened by Dr Helen McDonald (University of Cambridge), who is the author of H is for Hawk, and she commented that she thinks it is ‘beautifully curated’. Fiona Price is the curator and among the issues she raised was how humans are responsible for the sixth mass extinction event and we need to rethink our ideas about animals accordingly, something Diane completely agrees. 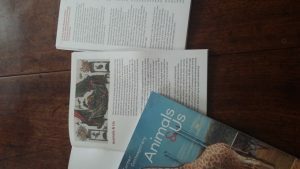 Indeed, Diane is working on several projects related to spreading knowledge and understanding of various medieval animals in this way, and we also hope to attract funding to be able to take this further – education packs; activity workshops, and publications – I’ll let you know how things progress.